I’m so sick of singularization & appropriation of the phrase “XYZ Life matters” to continue the hate mongering amongst the Human Race!!! All Lives matter. Not any single life matters more than another. We are all humans-Period! Please read a book and before jumping into the hate wagon. Before spewing ignorant anger fueled rants, think & educate yourself; research and acquire verifiable facts. Don’t copy paste whatever information or misinformation out there in the web or social media. If you are a real Christian just remember that we are suppose to be like JESUS! If you can’t speak words of peace then please don’t spew out hatred disguised in divisive wording. 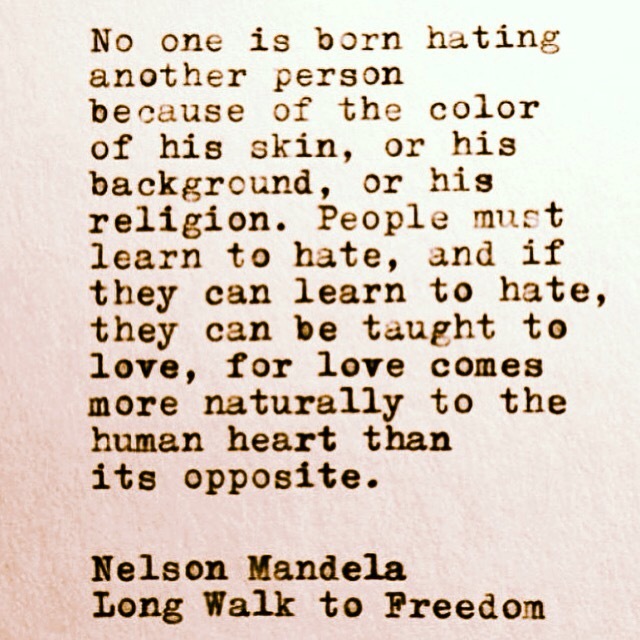 Hatred is learnt. Love is the only redeeming quality we as the human race possess. However, sadly to say, Love is becoming extinct. We show more kindness to our pets than to our fellow humans. It’s sad!!! This entry was tagged truth #alllivesmatter #stoptheignorance #stopthehipocrecy #HumanRace #peace #kindness #WWJD #examples #LOVE #Mandela #Summer2015 #law #immigration #ignorance. Bookmark the permalink. Wish I could hit “Like” dozens of times. So true, this.